Here’s a news story about the Green Bay Packer bikini girls that I blogged about earlier this year. This year, they’re going with pink bikinis for breast cancer awareness. The plan is to charge a few bucks to have a photo taken with the bikini girls, with the proceeds donated to fight the disease. Right, so this is a weird one: we’re getting tons of reports–tons–about failing Zune 30s. Apparently, the players began freezing at about midnight last night, becoming totally unresponsive and practically useless. So, all the 30GB Zunes have decided to throw themselves on a beach to die. What a hilarious way to start off 2009! But seriously, how many people does this really effect? I don’t know of anyone who admits to owning a Zune. I was struck by the flu this Christmas which caused me to spend Saturday on the couch sleeping and half watching three college bowl games- the Meineke Car Care Bowl, Champs Sports Bowl, and the Emerald Bowl. The Emerald Bowl is sponsored by Emerald which makes nuts and commercials that they think are funny but really aren’t. I wasn’t planning on watching any of these games, but when you’re sick, it’s better than nothing. During the Champs Sports Bowl between Florida State and Wisconsin I saw a profile on the FSU player Myron Rolle. Impressive individual. Very refreshing to see an exceptional scholar athlete. 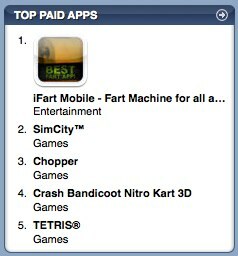 With all the applications on the iTunes App Store, what’s the number one paid application on December 23, 2008? It’s the iFart Mobile– Fart Machine for all ages. iFart Mobile is a Digital Sound Machine and entertainment system which brings endless laughs and enjoyment to its users. Combined with more usefulness and functionality than some other popular applications, iFart has a built-in security system designed to surprise and discourage iPhone theft, as well as a “Sneak Attack” function ideal for pulling pranks on parents, children, friends, teachers, workmates and employers alike. (1 star) I tried and tried and this prank does not fool anyone. The fart sounds are way to fake. 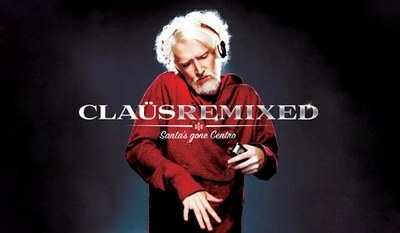 As part of the Santa’s gone Centro Palm campaign, you can text ClaÃ¼s your holiday wish! You might be granted your wish or a Palm Centro. The Supreme Court’s decision in Bush v. Gore, issued eight years ago this month, was widely understood to work like that tape recorder in “Mission: Impossible.” It was meant to produce a president and then self-destruct. This is an interesting article regarding the legacy of the Supreme Court decision of Bush v. Gore that helped decide the election in 2000. While the decision was only meant for the specific case, it is currently being invoked in many other election cases. Whenever the Supreme Court gets involved their words and decisions carry a great deal of weight. 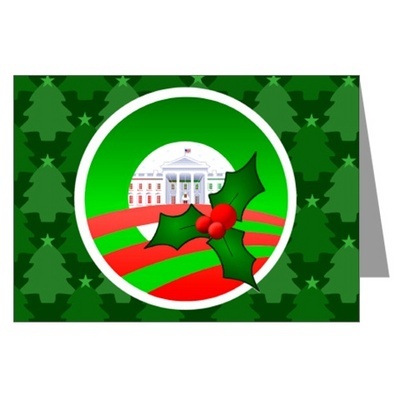 My friend Annie sent me this Obama themed Christmas Card! One of my Procter & Gamble friends gave me a can of Pringles Extreme Screamin’ Dill Pickle that came from her Christmas gift package from the company. I was going to write a review, but this one pretty much sums up what I think about Pringles Extreme Screamin’ Dill Pickle. I think that Palm is pretty much a dead duck, caught in the market between the iPhone and the Blackberry, but I do find the Santa’s gone Centro ad campaign staring ClaÃ¼s to be pretty amusing.